Industry Experts, Inc. introduced a comprehensive global market report on Inorganic Pigments. The new report titled “Inorganic Pigments – A Global Market Overview” reveals that Titanium Dioxide accounts for about three-fourth of global inorganic pigments market in 2018 while Carbon Black is projected to register the fastest growth through to 2023. Inorganic pigments are comparatively easier to disperse and the dispersion process typically requires three principal components, i.e., pigment, surfactant and grinding vehicle. These three ingredients are precisely calculated and blended during the formulation process. The processing of pigment dispersions faces the challenge of stabilizing the primary particle size and if this is not performed appropriately, the pigment aggregates into groups interconnected through intermolecular forces. Since inorganic pigments are easier to disperse compared to organic pigments, they are extensively utilized in several plastic, printing ink and paint & coating applications. These favorable characteristics of inorganic pigments are likely to drive future market growth. Asia-Pacific is the largest global market for Inorganic Pigments and also the fastest growing, with the region’s dominance very likely to continue. Rapid industrialization, infrastructure building and a burgeoning automotive industry in regions, such as China and India, will increase demand for paints & coatings, the largest and fastest growing application area for inorganic pigments. The worldwide market is estimated at US$16 billion in 2017 and is forecast to reach US$16.8 billion in 2018. This comprehensive market report reviews, analyses and projects the Inorganics Pigments market for the period 2014-2023 globally, and the regional markets including North America, Europe, Asia-Pacific, South America and Rest of World. Global markets for inorganic pigment types analyzed include Cadmium, Carbon Black, Chromium Oxide, Iron Oxide, Titanium Dioxide and Other Inorganic Pigments. The study also explores the major applications of organic pigments including Paints & Coatings, Plastics, Printing Inks and Other Applications. Inorganic Pigments market is segmented into five major global regions namely, North America, Europe, Asia-Pacific, South America and Rest of World. The regional markets further analyzed for 15 independent countries across North America – The United States, Canada and Mexico; Europe – France, Germany, Italy, Russia, Spain and The United Kingdom; Asia-Pacific – China, India, Japan and South Korea; and South America – Argentina and Brazil. 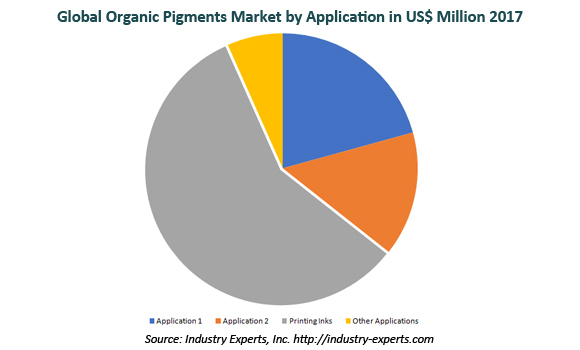 The report analyzes the Organic Pigments market in the above regions by major country, product type and key applications. This 448 page global market report includes 237 charts (includes a data table and graphical representation for each chart), supported with a meaningful and easy to understand graphical presentation, of the market. The statistical tables represent the data for the global market by geographic region, product type and major application. The study profiles 14 key global players and 57 major players across North America – 15; Europe – 16; Asia-Pacific – 25; and Rest of World – 1. The report also provides the listing of the companies engaged in the manufacturing and supply of inorganic pigments. The global list of companies covers addresses, contact numbers and the website addresses of 204 companies.